Andy Stanley, Pastor of NorthPoint Community Church outside of Atlanta, Ga, said, in his recent Easter sermon, "History's Mystery", basically, "the Bible didn't exist until around 300 - 400 AD". "for 300 years there was no Bible" and "they had no New Testament for really, 400 years". (at the 5:56 time mark to 6:20 mark) This is a sloppy and misleading statement, because it sounds like the individual NT books didn't exist, but they all did, by 96 AD. They were individual scrolls and early churches used them, read them, taught them, and quoted them in the first 3-4 centuries. They only didn't have all 27 books all together under "one book cover" or "canon list". Originally, "canon" meant "rule" or "standard" or "criterion", and later came to mean a "list of God-breathed books" or "a list of inspired books". Whatever is "God-breathed" Scripture, is therefore "canon" or rule or standard. 2 Timothy 3:16 says "All Scripture is God-breathed . . . " Whatever God inspired as revelation that was written down, by reason of the character of the writing being from God Himself, those were the books that were discerned as "canon"/ standard / rule. Statements like "the Bible did not exist for the first 3 centuries", can make people in the audience vulnerable to Roman Catholic apologetic claims. That is what happened to my friend Rod Bennett; he was not well taught in the canon issues as a Protestant, and so fell prey to that kind of argument. They claim that the church authoritatively decided and determined the canon (the list of which books are inspired/ "God-breathed"). No; rather they were determined by God the Holy Spirit to be "criterion" / "standard" / (the original meaning of "canon", as soon as they were written as individual books / scrolls. It just took time to collect them all under one "book cover" or "canon list", so to speak. The early church discovered, discerned, witnessed to which books were already "God -breathed" and therefore, by nature, were "canon" / criterion / standard. Dr. White rightly points this out in this screen flow. If Andy means the final form of where there was unanimous agreement as to the canon list, as in Athanasius' list in 367 AD, then that is right, but the way he communicated his statement makes it seem like the individual letters / gospels did not exist in churches to guide them into the truth and doctrine and practice. But even long before Athanasius in 367, Origen around 250 AD indicates the same 27 NT book list. See here. Below is a compilation of statements that I originally tweeted yesterday and today, but expanded here in this article. The Scriptures existed and were "God-breathed" right when the ink dried, therefore "canon" when written. (R. C. Sproul, Sola Scriptura: The Protestant position on the Bible, page 82 - "For the Reformers, the Bible was canon as soon as it was written. "); they were individual books, to be exact scrolls; later collected under one "book cover"/canon list. For a Protestant to say, "the Bible did not exist until 300s or 400s AD", gives credibility to Roman Catholic apologetic claims. Andy Stanley needs to clarify his statement. Clement of Rome, in 96 AD, wrote, "take up the epistle of Paul to the Corinthians", affirming that 1 Corinthians was written in 55 AD, and considered God-breathed Scripture by Clement. All the 27 NT books existed by 96 AD, they were just not collected together under 1 canon list or "book cover" yet. The nature of the NT documents-they were individual letters/gospels written on scrolls: the Codex form did not even exist in common usage until about 150-200 AD. Before then, books and letters had to be individually rolled up as scrolls. So, the form of a modern book, with a binding, flat, etc., did not even exist when the individual letters were written to different areas in the first century. The apostles Peter and Paul were executed by Nero around 67 AD. This means that all their letters were written and existed before then. The book of Hebrews also was clearly written before 70 AD, because he presents his argument based on the fact that the priests were currently offering sacrifices and the temple was still standing; but He says Christ was the final, once for all time, sacrifice. If he was writing after 70 AD, he would have said, "And we have proof that Jesus is the fulfillment of all the sacrificial system, because God ordained the Romans to come and destroy the temple in 70 AD, thus proving that Christ is the final sacrifice. The Gospel according to Mark (written sometime between 48-60 AD), James, Galatians, written around 48-50 AD; these are the earliest NT documents; they existed, and churches used them and quoted from the them in the first 3 centuries. So it is misleading to say, "The Bible did not exist until the 300s or 400s AD". We know Galatians was written before the Jerusalem Council in Acts 15 in 48-49 AD (Carson, Moo, Intro to NT, p. 464), because if Galatians was written after that, Paul would have mentioned the decisions in his letter to the Galatians to bolster his case. The fact that he does not mention those decisions is proof that the letter to the Galatians was written sometime before the Jerusalem Council of Acts 15. We know that Luke wrote the book of Acts shortly after his release from the 2 year in house prison because of the abrupt ending and lack of other details as to what he did after that. ("other considerations suggest a date not long after 62 AD". (See Carson and Moo, Intro to NT, page 300.) This means The Gospel of Luke was written before then, in 60 or 61 AD, or before Acts early in the year of 62 AD. Most conservative NT scholars believe the Gospel according to John, the letters of 1, 2, 3 John, and the book of Revelation were written somewhere between 80-96 AD, but some argue for a pre- 70 AD dating. That leaves the little book of Jude to be around 80 AD, and "the faith once for all delivered to the saints" (Jude 1:3) (or verse 3) may indicate it was the last book written or one of the last NT books written. The main reason liberals date Matthew, Mark, and Luke after 70 AD, is because they don't believe in supernatural, predictive prophesy, but Jesus clearly predicted the destruction of the temple in Matthew 24:1-3 as future to Him (spoken in 30 AD before the cross), and, it indeed happened in 70 AD. It is interesting that "a generation" was generally considered "40 years". This has implications for Matthew 24:34 - "this generation will not pass away until all these things take place". Does Jesus' woes and judgment pronouncements on that generation living at that time extend from Matthew 23:36 ("all these things will come upon this generation") to Matthew 24:34 ? 80 AD - Jude - "the faith was once for all delivered to the saints"
So, when admitting that the Bible in its final book form or canon list was not available until either 250 AD (per Origen) or 367 AD (per Athanasius Festal Letter 39), we should make clear that the books of the NT were already written from around 48-96 AD, and that the early churches each had either one gospel (maybe 2 or 3) and one or more NT letters; that they were never without some portion of Scripture. Pastors and teachers should be careful the way they communicate the issue of the canon and the history of it in the early church. The fact that there was no "Bible" prior to the 4th-5th century is quite true. It is also true that all the books which comprise that which would be declared to be "The Bible" were all written prior to 96AD. That some books were widely read in the early churches MAY be true, but the fact is that there were few copies available in the first 300 years of the Catholic Church and not because they were forbidden, but because all copies would have been hand-written. There is no doubt that many of the books are rightly declared as being part of the Canon of Sacred Scripture in the earliest of canon lists - but likewise several books were included in these lists which eventually were not included while others were excluded but eventually made it into the official canon. Should pastors be careful in how they describe the early canons? Yes, I would agree with that! They should also be honest about how the canon developed and was not 100% accepted. Basically I agree, if there is enough time to make clear that the individual books were already canon when written, because they are "God-breathed". But I suppose you are also wanting books like Shepherd of Hermas, Barnabas, Didache, Wisdom of Solomon, and Apocalypse of Peter to be mentioned as possibly considered by some (Muration Canon and Codex Siniaticus) as "canon" also. But it could be argued that Codex Siniaticus is just making use of the space and material, not proof that they thought they were canonical. And I would agree as well... except for the point of "just making use of space." In the time before the printing press (and we're talking more than 1000 years prior to it) adding to the "space" was much more laborious and thus not a very logical argument. So, while it "could be argued...", such a paradigm is quite unlikely. The more likely is that they appreciated the Shepherd, Barnabus, Didache, etc. and included them because they did preach the Gospel message - but for any number of reasons (and there are a few) the later counterparts decided against their inclusion in the canon. As for the point about them being "canonical" at the time they were penned, while it is true they were and are God's Word at the time they were penned, it is a bit anachronistic to argue they were canonical prior to the existence of canon lists. Scott, you have to define what you mean by canon. If canon for you means that there should be a canonical list defined by an ecclesiastical body, then you correct in saying that it is anachronistic to assert the canon prior to the list. However, the definition of what is a canon and when a book becomes canonical is at issue. For me, the canon is a result of inspiration. When God inspired some books and not all books, he basically created the canon. Thus, the canon exist even if no ecclessiatical body defines it. I understand what you're saying - but I must stress - words have meanings. A "canon" (in this context) is a LIST or COLLECTION of sacred books which are accepted as genuine. Thus, to say a book or collection of books is "canonical" BEFORE the LIST or COLLECTION is assembled is purely anachronistic. To be "canonical" does not equivocate to being "inspired." In the case of Scripture, those books which were eventually included in the Canon of Sacred Scripture are indeed ALSO inspired (God breathed) and the inclusion into the canon did not make them inspired. They were, indeed, inspired even prior to them being penned (the writer first had the inspiration and THEN put it to paper/papyrus). By the same token, just because something is not in the formal canon does not mean it is not inspired! Many other books are considered worthy to be read and could be considered inspired and inspirational - they just were not part of the official canon. Back to the point - NONE of the books were "canonical" prior to the establishment of a "canon." In simpler terms, NONE of the books were part of the "list" prior to the "list" being compiled. Also keep in mind, there were SEVERAL "canons" prior to the 4th-5th century.
. . . words have meanings. A "canon" (in this context) is a LIST or COLLECTION of sacred books which are accepted as genuine. Words have meanings, yes. But the original meaning of "canon" was not a list, rather "criterion" / "standard" / "rule" - the meaning of "list of sacred books" came much later. (the writer first had the inspiration and THEN put it to paper/papyrus). No; 2 Timothy 3:16 says the writings are God-breathed, not the person. The person was guided by the Holy Spirit (2 Peter 1:20-21), using their own personality, but it was the writings themselves that are God-breathed. > KT: Words have meanings, yes. > sacred books" came much later. sw: Without going into the etymological fallacy, the use that we are talking about is clearly the use of canon lists as produced (several different ones) in the first 400 years of the Church. The real underlying point here is that the canon did not determine itself. If the canon were self-determining, there would not have been any debate over it - much less 400(+) years of said debate! No, it was ultimately declared by the Church through the Holy Ghost. 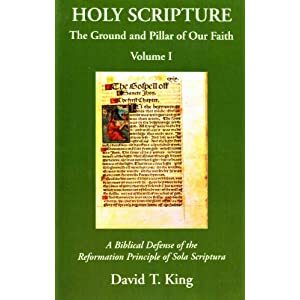 The real reason you do not accept this explanation is that it is quite damning to the concept of sola scriptura because you accept, without exception, the canon of the New Testament as declared by the Catholic Church through the Holy Ghost. Before the word "canon" was used as a list of NT books, it meant "rule", "criterion", "standard" in the explanations of "the rule of faith" or "canon of truth" - in Irenaeus(180-200 AD), Tertullian(190-220 AD), Origen (250 AD) (D. L. Williams, The Free Church and the Early Church, page 17) and was basically organized around the Trinitarian formula of Matthew 28:18-20; and is basically, the same doctrinal content as what later became the Apostles Creed, the Nicene Creed, and the Chalcedonian and Athanasian Creeds. So, you are wrong. The standard, rule, criterion was the doctrinal truths of Christianity (which Protestants agree with because they came from Scripture and were taught to new converts before baptism, and functioned as "the standard" until all the NT books were discerned and discovered and put togehter under one "book cover", so to speak. So, I did not make an etymological fallacy. There was no real debate over the four gospels, Acts, Paul's letters, 1 John and 1 Peter. Clement and Pseudo Barnabas seem to allude to 2 Peter. Irenaeus, Tertullian - 180-220 AD affirm most of the NT books, both Irenaeus and Tertullian affirm the book of Revelation - before those 2 writers, there is just not much extant from the earlier writers; their output was small - Clement, Ignatius, Justin Martyr, Polycarp, Papias. What we have of their writings is too small to even quote or allude to very many of the NT documents, though they do allude to and quote from some. Clement, very early, uses Hebrews. But Revelation (Irenaeus, Tertullian) and Hebrews (Clement) are mentioned and affirmed early. 2 Peter by Clement and Psedo-Barnabas. The power of the NT documents is self-evident and they eventually won because of their self-evident power and quality as being "God-breathed". What is the context of this discussion? Beyond etymology, we're talking about canon lists of the Canon of Sacred Scripture. Yes, the word "canon" or "kanon" also has the meaning of a "rule" or "criterion," but in this context we're speaking of the lists which were put together, several of them in the Early Church. So, when we speak of the Canon of Sacred Scripture, these books were not canonical until there was a canon or list to which they belonged. One canon of the Old Testament is the Septuagint or Greek canon, another is the Palestinian or Hebrew canon. Catholics, along with Jesus and the Apostles, used the Greek canon; Protestants and post-Christian Jews adhere to the Palestinian canon. Pre-Christian Jews followed a mix between the Alexandrian (Greek) canon and the Palestinian (Hebrew) canon. Then there came the New Testament canons. One of the first recorded canon lists was the Marcionian Canon, and while Marcion was declared an heretic, it was not because of his canon - though it was controversial. Irenaeus argued for a 4 book Gospel canon and Origen presented a canon quite similar to the current New Testament canon, except he did not include James, 2 Peter 2nd and 3rd John and he did include the Shepherd of Hermas. I could go on, but the point is which canon list? If any book belonged to any canon, then it was "canonical" per that canon. The final canon of Scripture does not exist until the late 4th century, so per that canon, while many books were not disputed by that time, none were part of that canon until that canon existed. Scott says ... it [the canon] was ultimately declared by the Church through the Holy Ghost. Origen seems to have had the same 27 NT book canon as Athanasius in his commentary on Joshua, though he makes other comments about 2 Peter and Jude in other places and contexts. "So too our Lord, whose advent was typified by the son of Nun, when he came sent his apostles as priests bearing well-wrought trumpets. Matthew first sounded the priestly trumpet in his Gospel. Mark also, Luke and John, each gave forth a strain on their priestly trumpets. Peter moreover sounds loudly on the twofold trumpet of his epistles; and so also James and Jude. Still the number is incomplete, and John gives forth the trumpet-sound in his epistles and Apocalypse; and Luke while describing the acts of the apostles. Lastly however came he who said, I think that God hath set forth us Apostles last of all, [1 Cor. 4:9] and thundering on the fourteen trumpets of his epistles threw down even to the ground the walls of Jericho, that is to say all the instruments of idolatry and the doctrines of philosophers." Yes, the word "canon" or "kanon" also has the meaning of a "rule" or "criterion," but in this context we're speaking of the lists which were put together, several of them in the Early Church. Yes, but I am saying the use of the word canon, meaning "measuring rod", "rule", "criterion", "standard" - Galatians 6:15, Irenaeus (180-200), Tertullian(190-220 AD), Origen (250 AD) makes it very important background as to why it later had the meaning of "list of NT inspired books". The context includes the historical background/development of the word and concept. And those who will walk by this rule (kanon, τω κανονι from κανων) , peace and mercy be upon them, and upon the Israel of God. the principle of the new creation, in verse 15. One of the first recorded canon lists was the Marcionian Canon, and while Marcion was declared an heretic, it was not because of his canon - though it was controversial. It was related, because his heresy of rejecting the God of the OT, rejecting God's Sovereingty and God's right to judge sin and His holy anger; and rejecting creation as good, was the reason why he rejected the OT and the pastoral Epistles, and Matthew, (becuase of so much OT in it), because they taught, "everything created is good", and for marriage. Since the rule / canon of faith is basic doctrine that later became the creeds, and was used as the main standard for what is Christian and what is not in the 1-4 centuries before Athanasius list in 367 AD and the provincial councils of Hippo and Carthage (380s-400 ) [regarding the NT], and all of the rule of faith is in the Scriptures, and the NT books existed by 96 AD, this is very important to the context. Origen's confirmation of the canon is also important, around 240 AD. Irenaeus and Tertullian also important to the context since they affirm most all the NT books in 180-220 AD. Steve wrote: Scott says ... it [the canon] was ultimately declared by the Church through the Holy Ghost. sw: The canon was completed in the late 4th, early 5th century. The official declaration would come after Protestants were dividing the canon and the Church utilized the charism of infallibility to declare the canon at the Council of Trent - keep in mind, Trent used St. Jerome's canon by name. Ken, I never denied the alternative use of the term canon, and that still doesn't make the subject/context of this thread about that other usage. Canon lists start very early in the Early Church - but the process took nearly 400 years to come to a completed canon. That was really what Andy Stanley's point was - though I agree, his point was poorly worded. I would also disagree with Stanley's statement that the Early Church didn't gather together to read what they held as canonical during the first 400 years. Was it The Bible as we know it today? No, but much of it was theopneustos (God breathed) Scripture. There is no doubt that many of the books are rightly declared as being part of the Canon of Sacred Scripture in the earliest of canon lists - but likewise several books were included in these lists which eventually were not included while others were excluded but eventually made it into the official canon. Thanks Scott for the comment clarifying when the official declaration was made. Question - Didn't Jerome divide the canon? No? Trent could not have used Jerome's canon, for Jerome specifically held that the Apocrypha books of the Intertestimental period (between Malachi/Chronicles 430 BC - until the time of John the Baptist and Jesus) were not canonical nor inspired. Steve wrote: Question - Didn't Jerome divide the canon? No? What St. Jerome did was translate that which he was commissioned to do. The Latin Vulgate is the same canon declared so by name at Trent.